Summer has always been a bit of a lull when it comes to video game releases. It's the time of year where we hear more about the upcoming fall releases rather than actually, you know, playing games . Luckily, we have the Humble Indie Bundle 8 to keep boredom, UV rays, and those treacherous, shark-filled oceans at bay. The Humble Indie Bundle traditionally features recent indie darlings for the low, low price of “whatever the hell you want”, and this year is no exception. 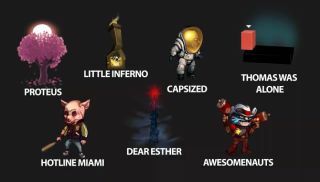 No matter what you pay, you'll get access to Little Inferno, Awesomenauts , Capsized, Thomas Was Alone, Dear Esther and their soundtracks (and Steam keys if throw in a dollar or more). Linux users should be happy to know that the Linux versions of these games are also debuting with the bundle. Like always, you can choose where your money goes, rationing out which developers and charities get your hard-earned bitcoins . You have a full two weeks to decide who gets what while stocking up on harpoons for the inevitable shark invasion .